Celestial Eye Goldfish: “Image of the Week” at Scientific American Blogs. Also, a bit about protecting one’s artwork online. 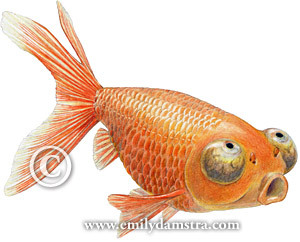 My colored pencil illustration of a Celestial Eye Goldfish is the ‘Image of the Week” at Scientific American Blogs, thanks to science artist and blogger Glendon Mellow who quoted me and included the image (with my permission) in his recent Scientific American blog post “How Do Artists Protect Their Work Online?” Thank-you, Glendon! My goldfish image is an example of my attempts to prevent copyright infringement and protect my clients’ investments; the image bears my URL and there’s a copyright symbol partially covering the image. Additionally, it’s only 300 pixels wide. The idea is that a small, watermarked image is less likely to be pilfered than a large size or unmarked image. Of course, the only perfect system for preventing online thievery is to not put them online, but I have to promote my business somehow! Most infringements are relatively harmless. People use my illustrations in their personal blogs, and sometimes they cite me as the illustrator and/or link to my website. I would like folks to ask for permission first, but I don’t get bent out of shape if I come across such infringement. One reason I’d like people to seek permission is that I do not own the copyright to or there may be licensing restrictions on some of the illustrations at my website; they are in my online portfolio solely to promote my business. Other infringements are not so innocent. Unauthorized commercial use of my illustrations has occurred on a number of occasions that I know about, and I’m none too pleased to discover that someone else is making money using my livelihood. These infringements have not given exposure to my business because they are not credited to me. Interestingly, in all but one instance (that I know of), the pilferer took my illustration(s) from a legitimate website where they are not watermarked for one reason or another (not my website). To me, that’s a good reason to keep using watermarks where possible. This is my fish! (Well, illustrated by you, but proudly displayed in my home). What a treat to run across it here!